Strawberries were supercheap at Aldi a couple weeks ago, and I ended up with a glut. I chopped and froze a lot of them for later use, but today as I was looking through my refrigerator, I found some fresh ones that threatened to go south if I didn’t do something with them soon. I also had a few brown bananas. The combination reminded me of my favorite yogurt flavor when I was a little kid: strawberry-banana. If it works in yogurt, why not in muffins? The resulting muffins are sweet without being too sweet, and are packed with more fruit than flour. Try them and let me know how you like them! 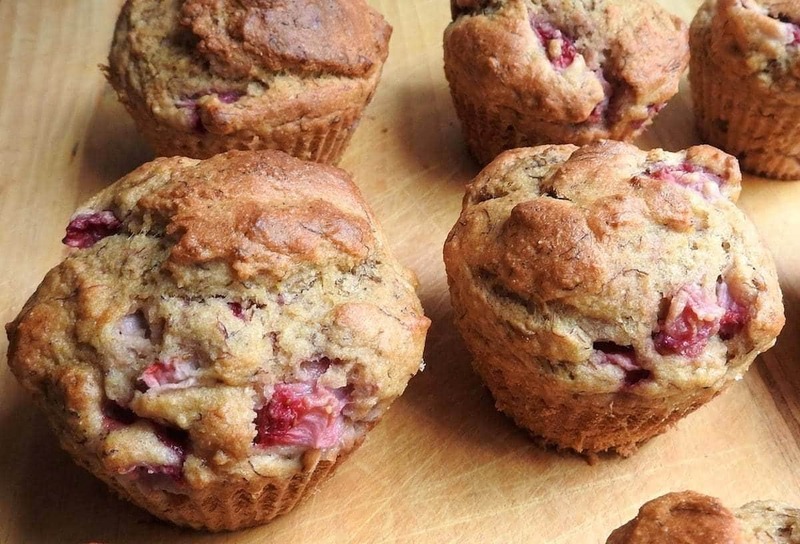 Strawberries and bananas are delicious together in muffins. This recipe has more fruit than flour, so it's packed with nutrition, too. Mix the flour, salt, baking soda, and baking powder in a large bowl. In a small bowl, beat together the bananas, vanilla, egg, oil, and sugar. Fold banana mixture into flour mixture. Beat in the mashed bananas and chocolate until just blended. Do not overwork the dough. Bake 20 to 25 minutes in a 375°F oven. Muffins are ready when inserted toothpick comes out clean. Thanks! Let me know if you have a chance to try them.